From left are Prof. Kyoung Jin Choi (School of Material Science and Engineering), Dr. Byung-Ki Cheong, Director of KUUC, President Mooyoung Jung of UNIST, Mayor Gi-Hyeon Kim of Ulsan, President Lee Byung Gwon of KIST, Dr. Jae Sung Lee, Vice President of Academic Affairs at UNIST. Translate cutting-edge research outcomes into viable commercial products activities. 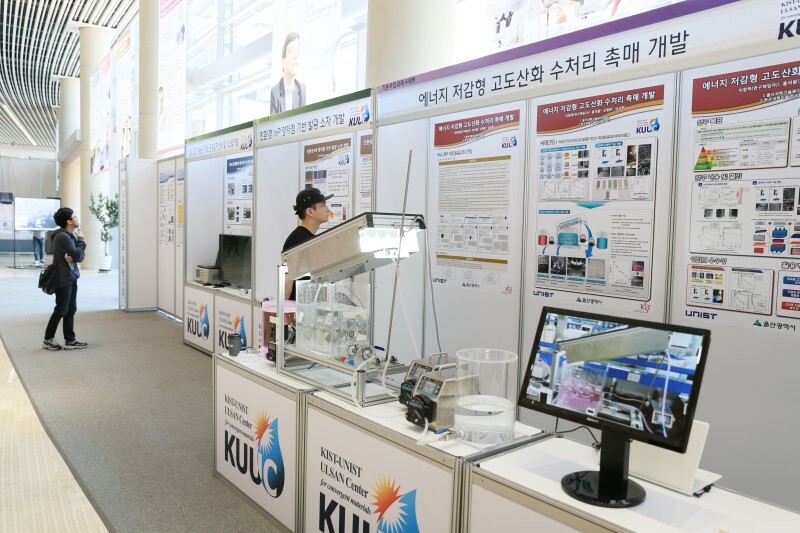 The KIST-UNIST Ulsan Center for Convergent Materials (KUUC) has arranged its annual performance evaluation meeting on May 11th, 2016. 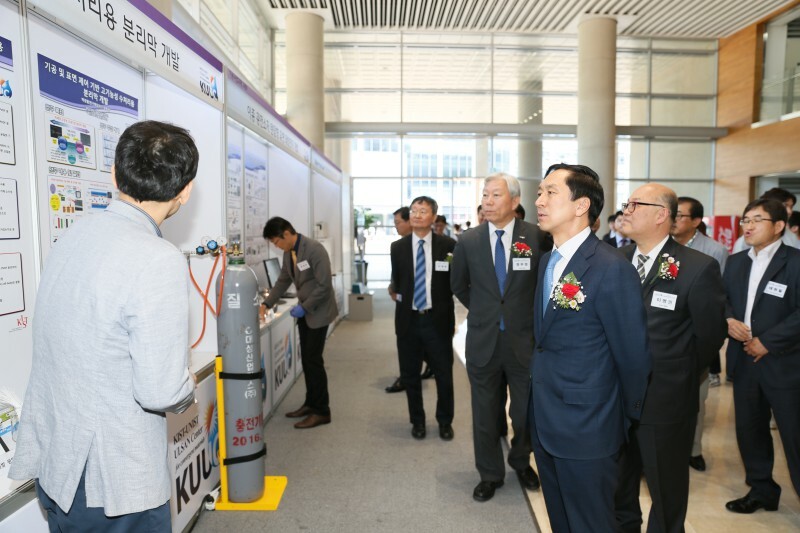 Attended by top officials from government and energy & environmental sectors, the event featured an exhibition for prototype solar cells, as well as high-efficient nano-based catalytic technology. The Mayor Gi-Hyeon Kim of Ulsan and President Lee Byung Gwon of Korea Institute of Science and Technology (KIST) were also invited along with other guests to partake in this event. The primary purpose of this meeting was not only to showcase exceptional works by KUUC, but also to conduct an interim evaluation of the research outcomes of KUUC. 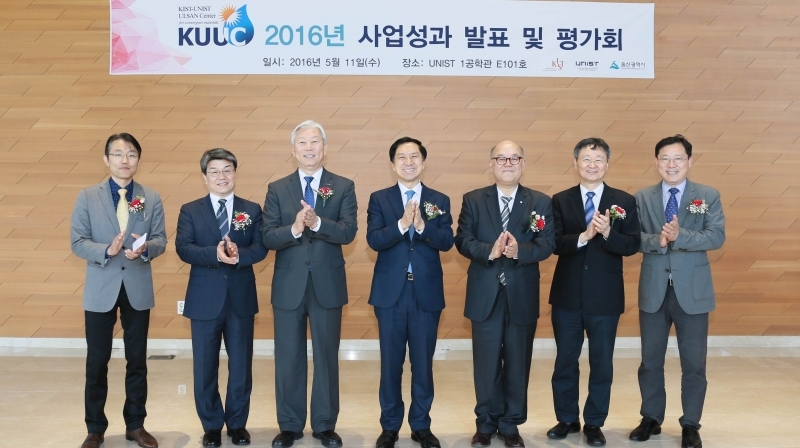 President Mooyoung Jung and the Mayor Gi-Hyeon Kim of Ulsan at the KUUC conference for cutting-edge convergence of technologies on May 11th, 2016. Founded in 2012, KUUC strives to fulfill its missions, which is to develop convergent materials and their application into energy and environmental technologies. The center aims to carry out next-generation R&D, while cultivating innovative future technologies, as well as science experts. Currently, the center has 18 patents owned and applied via convergent materials research in the fields of nano technology convergence, energy, and environment. Among those patents, the commercialization of the following technologies, such as “Eco-friendly Quantum Dot” and “Detection Sensor System for the Elderly” are in progress.